The main militant Kurdish group in Turkey says it is ending a unilateral ceasefire declared after the capture of its leader, Abdullah Ocalan, four years ago. A spokeswoman for the group, which has been pressing the government to announce a truce of its own, accused the authorities of failing to grant Kurds greater political and cultural rights. However, she said she did not expect a return to all-out conflict. More than 30,000 people were killed over a 15-year period as the Kurdistan Workers' Party (PKK) fought for autonomy in the overwhelmingly Kurdish south-east. The announcement came as thousands of Kurds staged a demonstration in Diyarbakir - the biggest city in the south-east - to press for more rights and to urge a general amnesty for Kurdish prisoners. Last month, the government introduced a partial amnesty aimed mainly at the PKK but it did not cover the group's leaders. The Kurds are Turkey's biggest ethnic minority, estimated to make up about one-fifth of the population of around 70 million people. 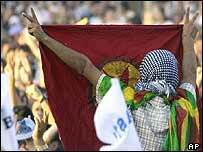 The PKK, which last year changed its name to Kadek (Congress for Freedom and Democracy in Kurdistan) said it had become impossible to maintain the ceasefire called after Abdullah Ocalan's arrest in February 1999. "It is announced that the unilateral ceasefire has come to an end as of 1 September and that the ceasefire can only continue bilaterally," a statement from the group was quoted as saying. Kadek had previously threatened to end the ceasefire at the start of September if Turkey did not respond to its calls for a truce. "I foresee some sort of low-intensity warfare," Mizgin Sen, a spokeswoman for the group said. She accused the Turkish Government of failing to fully address demands for Kurdish cultural rights, constitutional changes and freedom of expression, despite the passing by parliament of a number of laws removing restrictions on Kurds. "Taking decisions is one thing. Implementing is another... There are still serious problems concerning the Kurdish issue," she told the BBC. The spokeswoman said Ankara had recently stepped up operations against the group's guerrillas. She also insisted there had been no "military activities" by the PKK, although the rebels have been blamed by unnamed officials for some recent violence in the south-east. 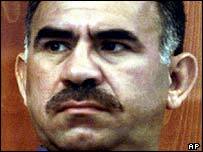 The group declared its ceasefire in September 1999 after the capture of Abdullah Ocalan, saying it would use political channels to resolve the conflict with Ankara. However Turkey - which along with the US and many European countries regards the PKK as a terrorist organisation - has repeatedly rejected calls to negotiate a solution to the Kurdish conflict.